Hello, and thank you so much for visiting me today. 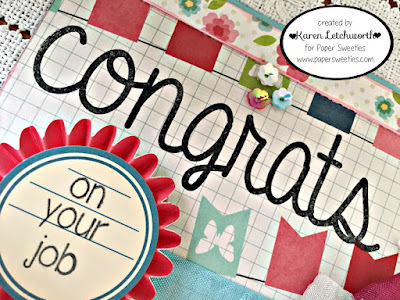 It's always a treat to have you stop by; and today I'm sharing a post to give you all a little peek at this month's new release from Paper Sweeties. 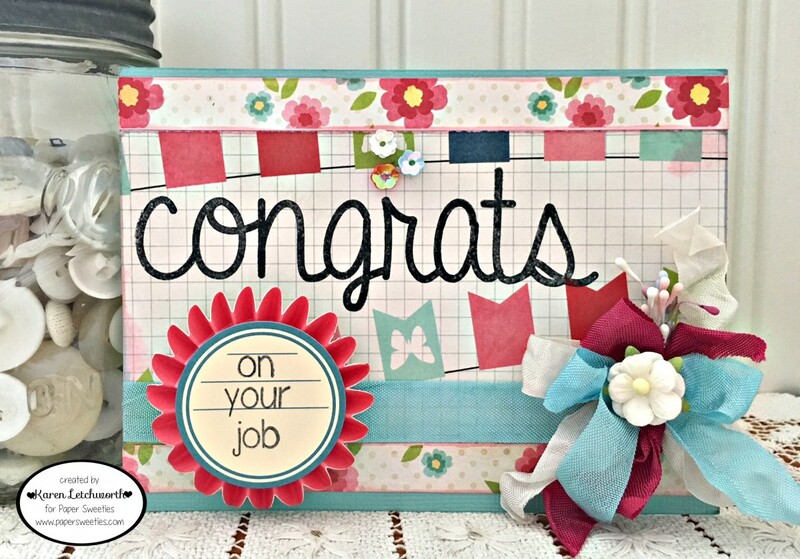 This month's new release set is called Congrats, and it will be available for purchase starting tomorrow, August 15. And what's truly AWESOME about Paper Sweeties is that all their products work together to compliment one another. This helps you expand what you have, and use different sets together to create endless possibilities. 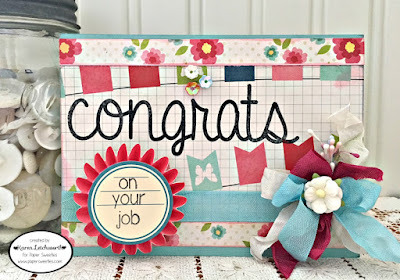 I simply placed some patterned papers on my cardstock base and ran a width of Robin Egg Seam Binding across my card, and then used it to tie a bow - along with a piece of Frosting Seam Binding and Strawberry Seam Binding topped with some stamens and a white sweetheart blossom. I used the Congrats Stamp Set to stamp the big word (congrats) on the patterned paper, and some of the smaller sentiments/words from this sweet new set to stamp the other words (on your job) on a sticker, which I placed atop a 3-D medallion (from the Dollar Tree). I finished my card by adding a few double-layered Sugar Sprinkles Sequins, Robin Egg Sequins, and Peppermint Sequins. Aren't they just the cutest SEQUINS ever? I sure think so! Paper Sweeties carries SO many adorable things....I just can't get enough. And I know that you will LOVE anything and everything you purchase at Paper Sweeties. They're the most fun to play with (in my opinion) and Paper Sweeties' products really allow you to push your creative boundaries and have fun! Thanks again for stopping by, and please come by again soon. 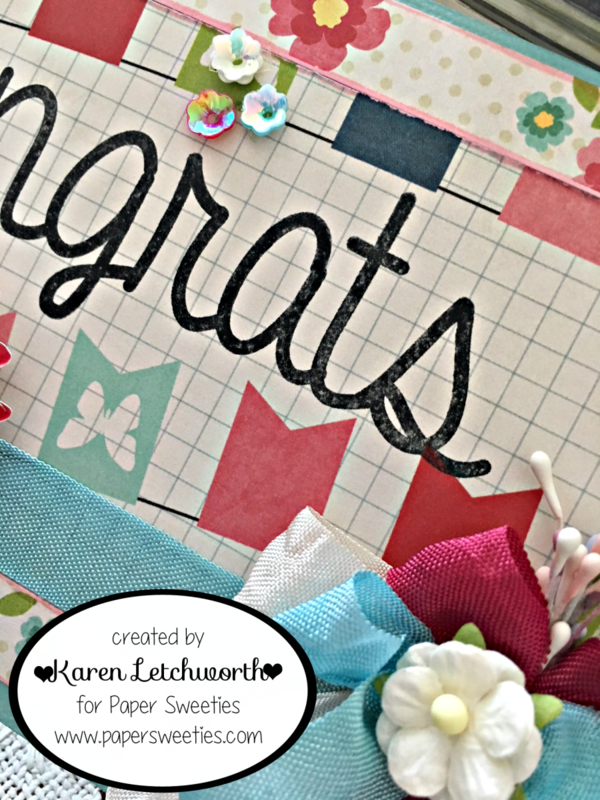 What a fabulous card Karen - love the colours you have used - that deep crimson with the blue is wonderful. Such a fun card! Love the colors and all the ribbons!